The "basic" little Moscatel is really nice, but if you can afford to treat yourself and friends to these latter two offerings, you're in for a wonderful experience. The 2010 is made entirely of Moscatel, though I understand they can blend in a small amount of Arinto, Malvasia and or Boais. The wine is served at about 50-degrees if served as a cocktail wine, while the Portuguese serve it a tad warmer if offered as a dessert beverage. The 20-Year-old still has a youthful exuberance about it. It is sweet, rich, round and has a very long finish to it. The youngest wine in this blend is 20 years old, while the older lots incorporated here are as much as 40 years of age! The 1966 displays aromas and flavors which reminded me more of a fine, well-aged brandy. While these are certainly not inexpensive wines, keep in mind the price of a luxurious bottle of Sauternes with 20-30 years of age...that thought should ease some of the "pain" of paying for these little half bottles. 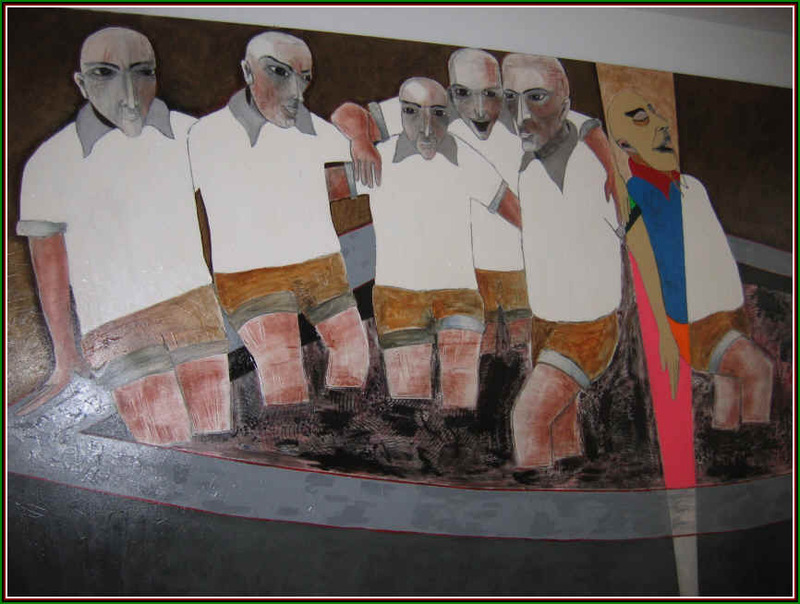 Jose Berardo's story is a remarkable one and he purchased the Joao Pires winery in 1998. He also acquired a share of the Lafite Rothschild enterprise in Portugal and he's sold a few shares of his Bacalh�a property to the French. 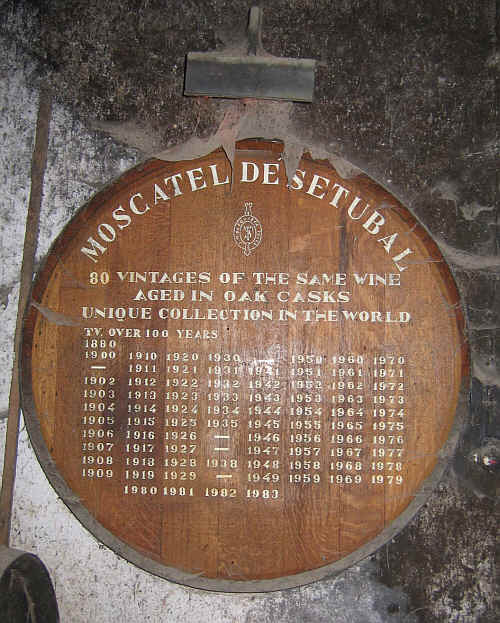 Some people identify Jos� Maria da Fonseca as the only producer of Moscatel de Set�bal, but, in fact, Bacalh�a has a cellar devoted to aging Moscatel. We visited the estate and found a special building devoted to the aging of these Moscatel wines...not temperature controlled, in fact, as the warm summer temps help mature the wine more quickly. Even so, though, they age some batches for an extended time. 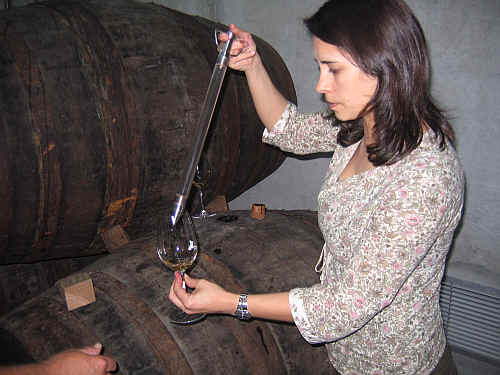 The entry level bottling is the basic Moscatel de Set�bal. 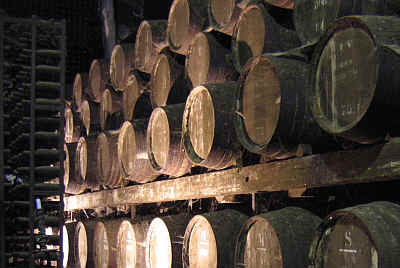 This is matured for approximately 8 years in old whiskey casks. The aromas are remarkable...sort of candied orange with some raisiny notes and a bit of a toffee note. It's sweet and can be paired with fruit or nut desserts or cakes. You'd serve this at cellar temperature, cooled but not chilled. There's an even more marvelous version, made from the Moscatel Roxo, a sort of reddish Muscat grape. Po�as Junior wearing a Weimax cap! 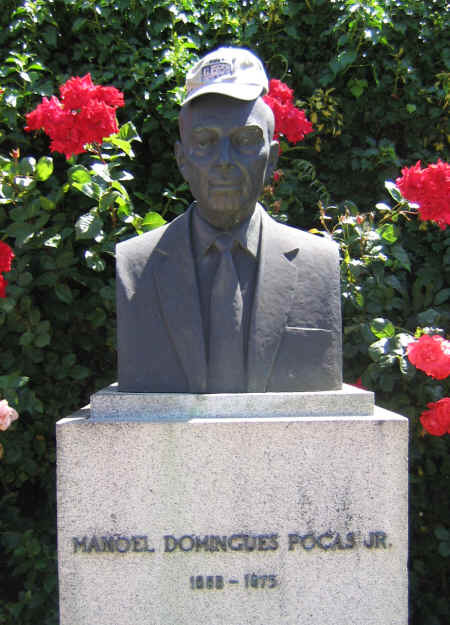 Yes, this is a funny name for a winery, but it was established in 1918 by Manoel Po�as Junior. Don't know much about Manoel Po�as Senior. The grandchildren of Junior (what are they, then? Junior-ettes?) took over the company in the 1970s and claim to be "obsessed" with quality. We've found their wines to be quite good, typically. 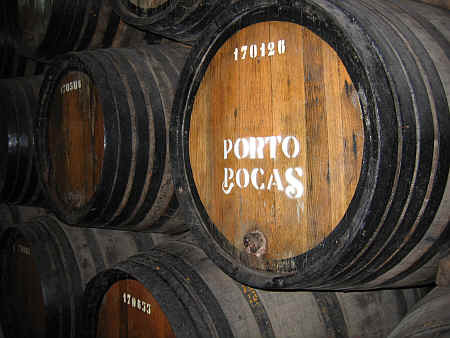 Their 1997 Vintage Porto shows, in fact, their obsession may bear fruit. Handsomely, too. This is a firm which has no U.S. marketing company to bang their drums. And they don't advertise in American wine publications, so they will get short-shrift from those who claim to objectively rate wines. On the other hand, their costs are modest and for those of us who like to actually drink wine, this is a firm to look to and support. The LBV is quite good. It's a medium-bodied, mildly sweet Port. Ready to drink now, of course. Their Colheitas are typically quite good. The 1982, now sold out, was a delight. The 1994 is quite good and well-balanced. 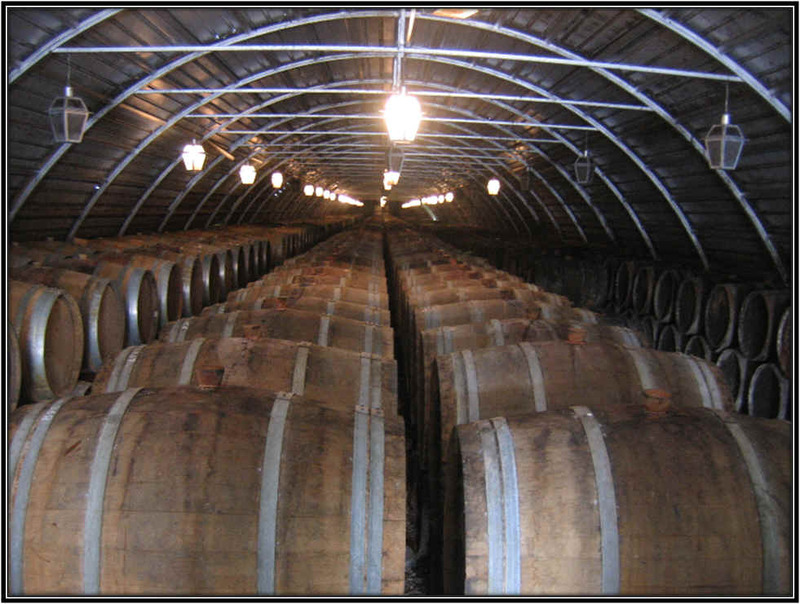 In the aging cellar at Po�as. The Graham's name is one of the top names in Port. 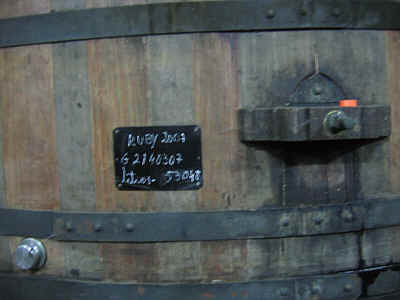 It is one of six labels owned by the Symington family (the Port "Mafia" which owns numerous top Port labels). 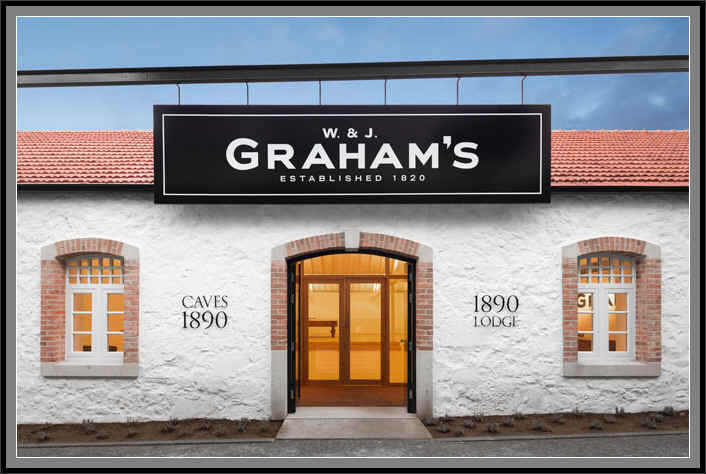 Graham's is named after two brothers who worked for this Scottish firm in Portugal. They were involved in the textile biz. Got paid for some fabric not with escudos, but with Port wine. The people back in Glasgow weren't very delighted with this transaction, until the wine got back to headquarters and was then sold. 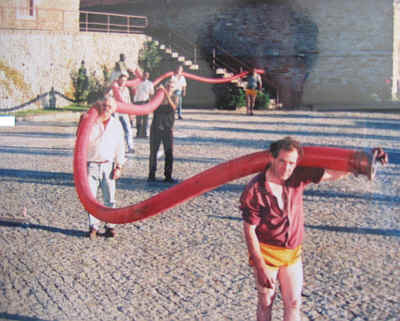 They then were in the Port wine business in earnest. The firm was purchased by the Symington's in 1970. One of their ancestors had worked for Graham's in the 1880s and then was affiliated with another Port firm. They have been making top quality Ports for decades and the brand is amongst the "elite" in terms of quality and prestige. Theirs is a brand which actually is reliable in terms of quality. Vintage Ports are tops, with the Graham's bottlings being in the category of "excellent." They make a second-tier Vintage Port bottling called "Malvedos" and consumers can look to that label for something sensibly-priced and offering value. The "Smith" here was the Mayor of a small British village called "London." The Woodhouses came along and joined him in his Port enterprise around the early 1800s. The firm was sold to Graham's in 1960 and the Symingtons bought it in 1970. Yes, the same Symington's of Graham's, Dow's, Warre's. The Ports from Smith Woodhouse can be quite good and seriously under-rated. The real "star" is their "Late Bottled Vintage Port," a wine which is matured for about 4 years in wood and bottled without filtration. The wine is then given lengthy bottle aging, being released when it's close to mature. Smith Woodhouse "LBV" is the Port for those who dream of drinking their 1966s, 1970s and 1977s, if they only had these or could afford the serious cash outlay it takes to acquire those sorts of wines. Being unfiltered, you'll be best served to stand your bottle upright to allow the sediment to "settle." Decanting is ideal. Most "LBV" Ports are filtered, so while they don't require decanting, they are often less interesting, having been stripped of some aromatics and flavor components. The Ten Year Old Tawny is a marvelous wine. Nutty, medium-bodied and sweet without being syrupy. This firm offers a less-costly alternative to the famous houses. The quality of their vintage Ports is quite good, though the wines may lack a shade of the finesse of Graham's or Warre's. The pricing, though, makes up for this and the wines are still pretty satisfying. Taste the 1980 vintage from Smith Woodhouse. This is a medium-bodied vintage Port. It's showing magnificently at the present time. You'll do well to decant it, of course. 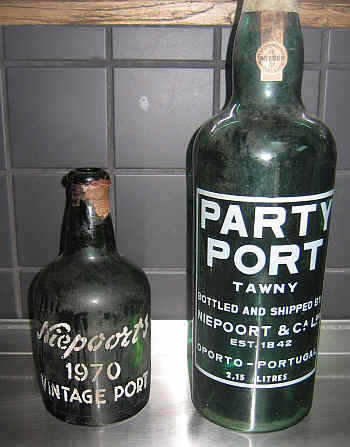 The Niepoort's have been involved with Port since, at least, 1842 when this firm was established. Dirk Niepoort is the winemaker and he, like his predecessors, is a stickler for quality. The firm is somewhat small compared to the really famous brands, yet it is very well-regarded in the connoisseur market, particularly in Europe. A representative of the firm comes over to the San Francisco market from time to time. "We don't make a huge amount of wine," he explains, "so we don't need a 'huge' marketing effort. Besides, our customers such as Weimax, who understand the quality of wine we make, are selling sufficient quantities of wine for us to be happy." Passadouro is, actually, a name you'll see on some table wine of Niepoort. Niepoort is passionate about quality: low yields in the vineyards. Later-picking than most vintners, as Niepoort prefers riper fruit and riper tannins. They still do a fair bit of the old-fashioned "foot-trodden" fruit. 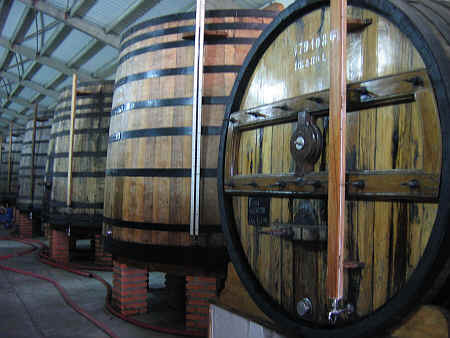 While they make some terrific Ports up and down the range, we're fans of their Colheitas. The number of 'vintages' of Colheitas has diminished a bit and prices of older ones has escalated. We have some nice bottlings in stock, but 20+ year old bottlings have gone by the wayside. The LBV is a fine example of this type of wine, being medium-bodied and close to those "Vintage Character" wines some firms offer. Very fine! Both are good and fairly priced, too. Certainly a good step better than basic "ruby" and "tawny." Niepoort also does a fantastic job with its White Ports. These are typically made of Malvasia, Viosinho and Gouveio. There's the "Dry White" which has a bit of skin contact during its fermentation. The wine is a blend of various years of White Port and when it's bottled, these average about three and a half years of age. It's nicely dry and is good on its own, but really morphs into something different when mixed with good tonic water. You'd enhance it with a slice of orange, lemon or lime. The Ten Year White Port is a more complex aperitif and it's delicious served in a large white wine glass...best chilled. 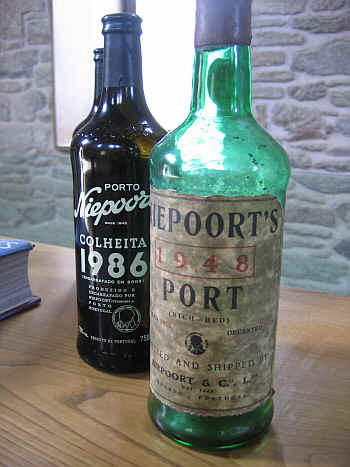 Gabriela Santos offers a taste of Niepoort's White Port.